Watson is the question-asking trivia-spouting Jeopardy-winning artificial intelligence that IBM has been working on. 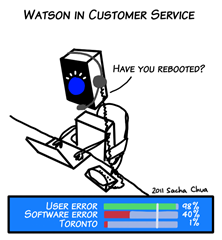 Aside from handily beating human contestants and prompting rounds of “I for one welcome our new robot overlords”, Watson might have interesting applications in medicine, law, and other challenging fields. What else might we use this kind of power for? I don’t think Watson can recognize speech yet, but maybe someday! 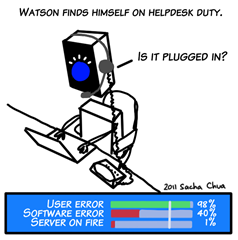 I’m not entirely happy with the helpdesk setup here. 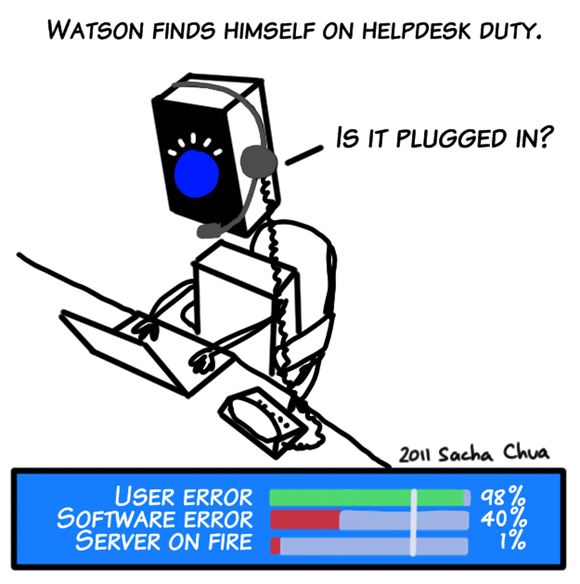 It’s a classic joke, but it twinges the same part of me that replaces "user" with "person" whenever I can. Also, totally awesome people use the systems I build. I run into far more programmer bugs and d’oh moments myself than classic "user errors". “Is it plugged in?” is further along the spectrum than “Have you rebooted?”, as rebooting is (unfortunately) still very much a valid approach to problems. Anyway, it was a joke that needed to be made. Now that we’ve made it, we can move on. 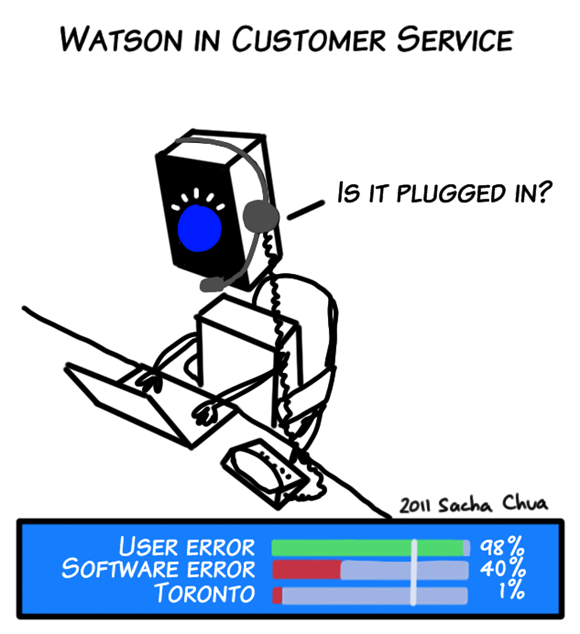 “Toronto” refers to Watson’s mystifying response to a question about US cities – understandable when you learn about how Watson works, but still interesting and strangely reassuring. The "server on fire" bit refers to this idea of printer on fire, which I think I came across in a compilation of funny Linux source code comments. There’s a story about that, of course. 2005: Hmm. Must hack my breathing.